Both my car and my motorcycle license have been renewed yesterday. To my little disappointment, what I got were once again valid for a year. I was under the impression that I’ll be given a license valid for five years after the temporary ones expired. What happened to me was an exact opposite of my friend’s experience though. 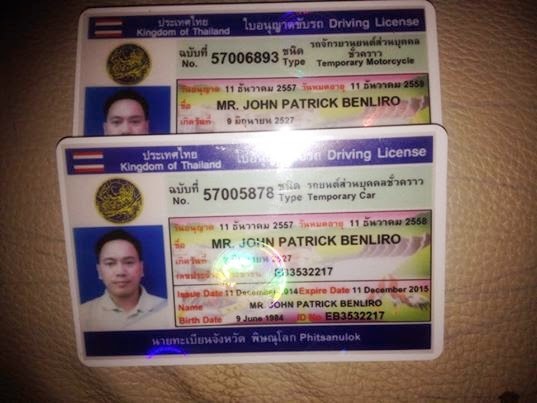 He was given five years validity just in time before his temporary license expired; and he did it without much irritating inconvenience. I’m a little disappointed, I admit. But mine albeit 1 year, is absolutely better than having an expired license. More so, a revoked ones. I’m gonna be in big trouble if I chance upon a police who sometimes stop cars and motorbikes. If they stop me and search for my license and I don’t have anything to show them – I am so dead. LoL. Anyway, enough of blabbing. If you are thinking of renewing you license, here are the things you need to prepare. I’m pretty sure they are all with you most of the time. To avoid inconvenience, have your documents copied. Make at least two copies each. Hand them over to the person at the desk and tell him or her you want to renew your license. Once the documents are checked, you will have a physical exam. Don’t fret. They’re just going to test your color recognition of the traffic lights. Red, yellow and green – ring a bell? A few questions here and there, and voila! You’ll be out of the room before you know it. Get the documents from the examiner, sign all of the copies, and hand them back to the person whom you first gave them to. After which, wait for your name to be called as they need to take a photo of you. Once you’re done staring at the camera, you will again be called to claim your license. Pretty fast, huh? It took me less than an hour and was driving back home. Did I say you have to pay 300 something baht for both car and bike? Yeah, you have to.